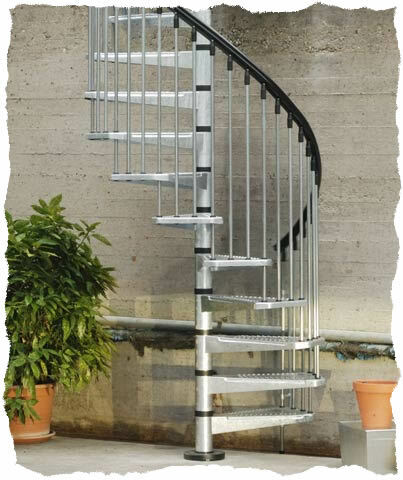 The Civic Zink Spiral staircase is available in 1200mm 1400mm and 1600mm diameters . From £832.50 + VAT Phone 01952 608853 With the Diameter and Floor to Floor Height for a Quotation. 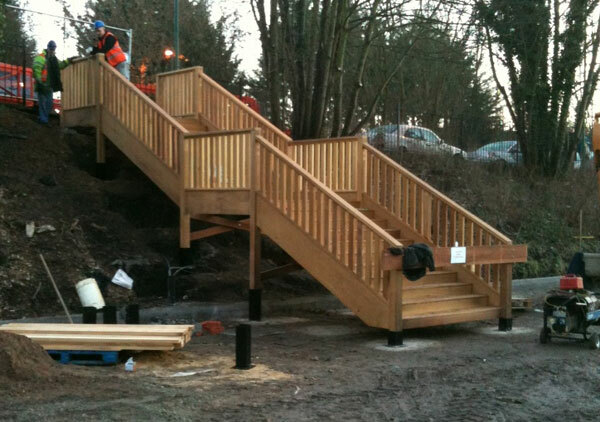 1 Landing, 12 Hot dipped Treads, Nuts and Bolts in Stainless steel, PVC Handrail and Railing. ....All included in the Price ! 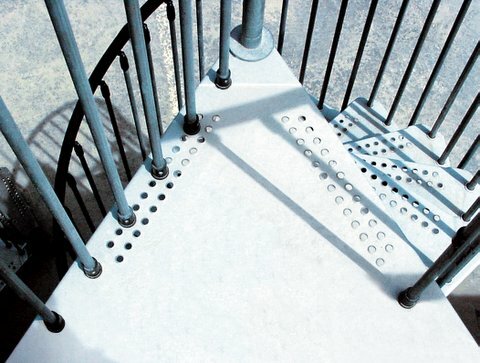 CIVIK ZINK the spiral staircase for external use which combines functionality and solidity with long-lasting certainty.All metal parts are protected by being hot-dipped in zinc,this finish being what characterizes CIVIK ZINK as a product exclusively for external use.The handrail is in black PVC.Nuts and bolts are in stainless steel..
CIVIK ZINK has an adjustable height between 252 and 305 cm.By purchasing certain supplementary items,the staircase height can reach 376 cm. hot dip galvanized to protect it from any sort of weather. 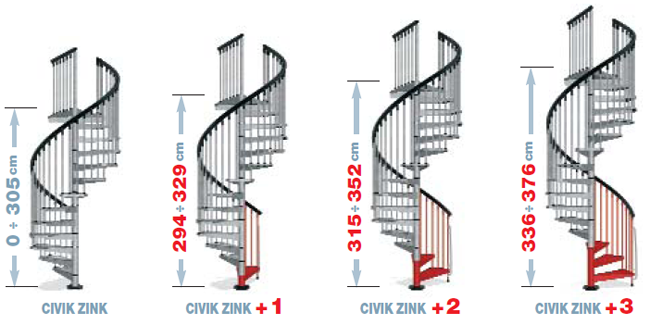 CIVIK ZINK staircases are characterized by a landing which allows the staircases to be fitted to openings without a hole or with a square opening.CIVIK ZINK has an adjustable height between 252 and 305 cm. 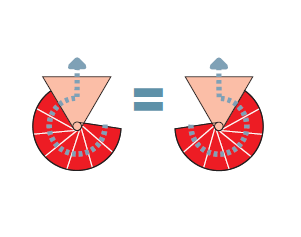 The direction of rotation, whether clockwise or anti-clock-wise,can be decided during the installation. The diameters of the staircase are 1200,1400 and 1600 mm. The recommended ceiling apertureis at least 50 mm larger than the diameter of the staircase. Example:Ø staircase 1200 mm = Ø aperture 1250 mm. Avaiable in 1200, 1400 and 1600mm diameters. The Standard Kit comes with 12 treads and a universal platform giving you a total of 13 risers. 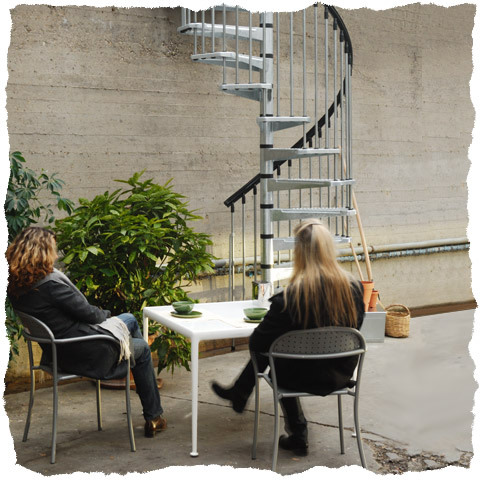 The Civic spiral staircase offers Value from Italian manufacturers Arke. 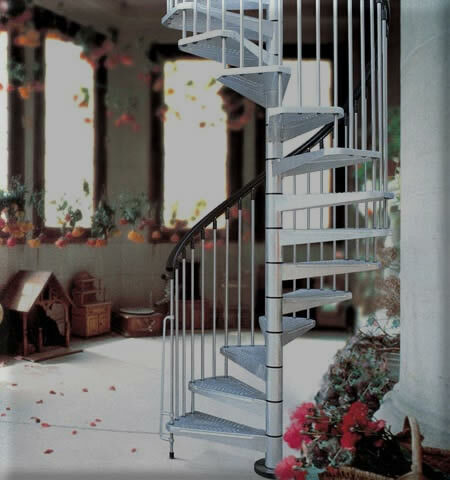 When it comes to working out the number of Risers required the Italian Spiral staircase kits work best with a individual rise height between 210mm and 235mm, UK Building Regulations require a Rise height no higher than 220mm But in many cases to get one of these to work you will have to go over this rise height, Remember these spiral staircases are designed for the european Market as a whole and not just the UK market. If your building control officer is offering no lenience then I suggest forgetting a spiral Staircase and go for a Double Winder Staircase. Home | Stairs | Stairparts | Terminology | Workshop |Staircase Plans | Jobs at Stairplan | Visit the Showroom..